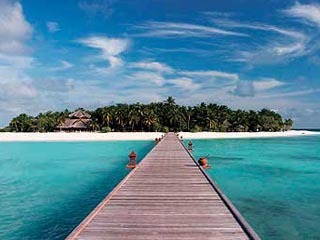 Cast away on a secluded coral atoll in the paradisiacal Maldives archipelago, you experience a sense of magic, romance and tranquillity at Banyan Tree Maldives Vabbinfaru is second to none. Time moves imperceptibly, while the gentle touch of the warm sun makes you recall wondrous dreams once forgotten. You'll find paradise here - catching the salty tang of the sea breeze as you wake up in the morning, swimming in between the wondrous sea creatures that dwell forty feet below, luxuriating in the pampered comfort of your own elegant villa and marvelling at the magnificent splash of stars in the night. 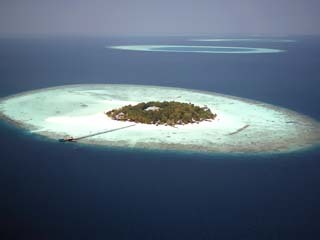 Occupying the entire island of Vabbinfaru, the jewel of the North Male Atoll, Banyan Tree Maldives Vabbinfaru lies in secluded luxury, yet merely 20 minutes by speedboat from the airport and Malι, the capital of the Maldives. Surrounded by dazzling white talc sand and the bluest of waters teeming with an astonishing abundance of soft corals and fish sparkling in brilliant colours, the exquisite beauty of this tropical haven is all yours. 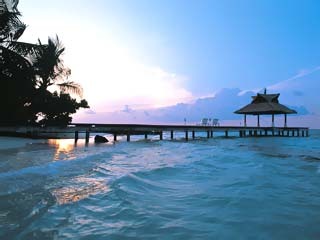 The beaches and surrounding waters remain accessible only to the guests. The hotel has: Jacuzzi Oceanview Villa, Jacuzzi Beachfront Villa, Beachfront Villa, Deluxe Jacuzzi Oceanview Villa, Deluxe Beachfront Villa, Deluxe Jacuzzi Beachfront Villa and Presidential Villa. The Jacuzzi Oceanview Villa delivers unparalleled privacy with its very own open-air Jacuzzi on a wooden patio and a sala (pavilion) in the walled garden. 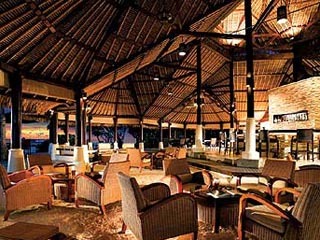 Relax under the shade of the pavilion while sipping your cocktail. Immerse yourself in the bubbling waters of the Jacuzzi and feel the tension seep away from your body as you drift off to the sound of waves lapping on the picture-perfect shores. With its private outdoor Jacuzzi and sundeck by the beach, the Jacuzzi Beachfront Villa is ideally suited for a romantic getaway. 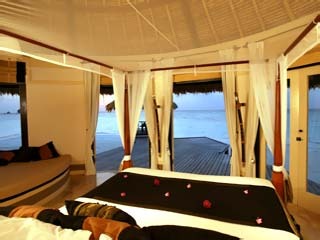 Watch the spectacular ocean vista unfold from the terrace, while the balmy sea breeze cools the room. 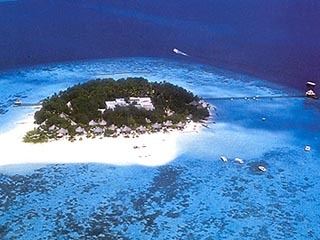 Or step onto the silky sand of the beach and swim above the virtually untouched house reef with its glorious display of color and the occasional trumpet fish, harmless baby shark and turtle. 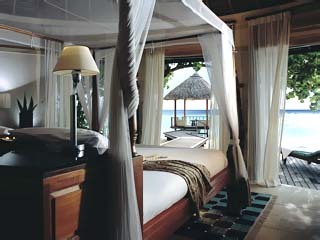 With direct access to the beach, the Beachfront Villa allows you to act out your Robinson Crusoe fantasies. 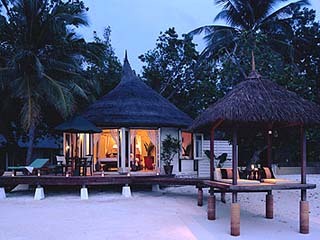 Unlike Crusoe's quarters, however, your isolated thatched roof villa offers real luxury and extraordinary comfort. You'll feast your eyes on the turquoise Maldivian waters from your open terrace and heed the call of the crystal clear lagoons inviting you to a close encounter with the stunning marine life a stone's throw away. The new Deluxe Jacuzzi Oceanview Villa invites you to relish the heavenly tranquillity of an enchanting garden from your own pavilion. The secluded garden setting of the new Deluxe Jacuzzi Oceanview Villa is much treasured for its generous space, privacy and shady greenery. The beach peeps through the leaves and entices you to soak up a golden tan, laze around and see your footsteps disappear in the sand as the winds blow from the sea. 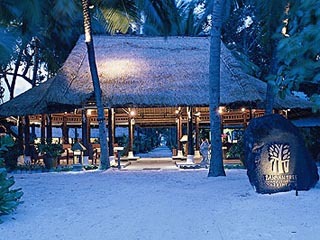 A heavenly place to pamper yourself with an in-villa BBQ or soothing massage. When you wake up with a view of the turquoise Indian Ocean, have breakfast on the veranda under shady coconut trees shaped by a divine hand and feel a warm ocean breeze massaging your face, life is good to you. 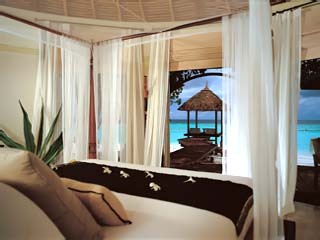 The new Deluxe Beachfront Villa invites you to relax, both in your villa and out on the beach. With a private pavilion reaching for the crystal-clear waters, a sundeck, cosy bedroom, contemporary bathroom and outdoor bamboo shower, finding pleasure couldn’t come easier. When you are surrounded by nature and gaze up on a canopy of a billion stars even taking a shower becomes a delight. The natural beauty of Vabbinfaru Island can now be experienced in the plush comfort of the new Deluxe Jacuzzi Beachfront Villa. The stylish interior has been designed to be bright and breezy – it opens on to a large sundeck at the front that leads to the powder-soft beach and into a glitzy bathroom at the back with an outdoor Jacuzzi and garden shower. Here you can take part in the play of nature and count the hues of the changing sky, as the stunning sunrise, sunset and star-filled night sky leave their shimmering reflections on the lagoon. Stay at the lavish Presidential Villa for an extravagant beach hideaway with a personal touch, including a chilled bottle of champagne upon arrival. The newly renovated villa enjoys the luxury of a large landscaped garden with ocean views, al fresco living pavilion, beach ‘sala’ pavilion, sundeck, Jacuzzi and outdoor shower. 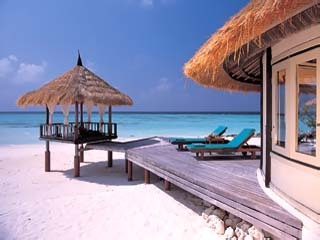 Families can opt for two or three inter-connecting Deluxe Beachfront Villas. Ample space makes the Presidential Villa ideal for small wedding parties; yet, priceless privacy can be found within each villa. Sit back and let the shooting stars fall into your lap. 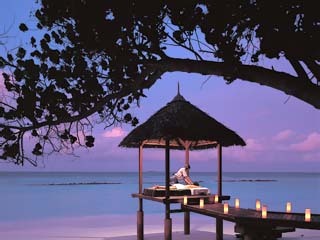 Day or night, wining and dining in the breathtaking natural beauty of the Maldives is simply unforgettable. A romantic experience you will cherish forever. Banyan Tree Maldives Vabbinfaru offers excellent dining choices ranging from eclectic Maldivian and International cuisine at Ilaafathi restaurant to candlelit dinners under the stars. 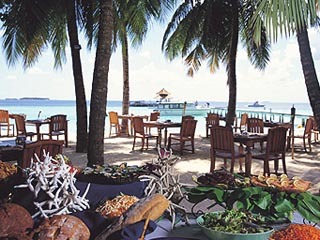 You can be sure that the cuisine is delectable, the setting exquisite and the atmosphere awe-inspiring. Bon Appetit or Ufaaveri Keumeh, as they say in Dhivehi. Ilaafathi Restaurant Tuck into scrumptious Maldivian and International treats in the casual setting of Ilaafathi Restaurant. Set right on the beach with a natural Alang-Alang roof, this beachfront eatery serves extravagant buffet breakfasts and superb set dinners that will make you come back for more. Naiboli Bar Appetizing snacks are served all day long at the open-air Naiboli Bar, along with your favourite cocktails. You can while away many happy hours chatting with friends, having a game of snooker, or simply unwinding in the warm and friendly atmosphere. Perfect for a light appetite in the middle of the day. 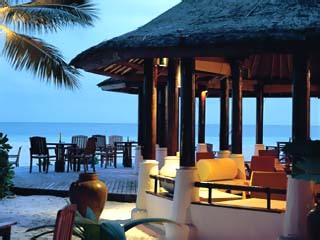 Private Dining Fancy having a wildly romantic candlelit barbecue dinner in the intimacy of your villa or by the beach? 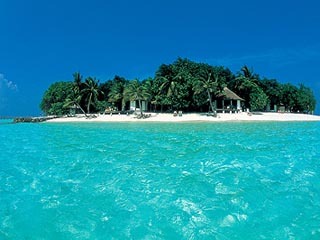 We'll arrange that for you and even provide you with your very own private chef and waiter. Spoilt by our attentive service and fine cuisine, you will feel pampered like royalty. Sandbank Dining Have you ever dreamt of sweeping your loved one off the feet with a romantic dinner that is out of this world? Let your imagination run wild and the hotel will make your dreams come true by taking you to a stunning sandbank by speedboat. The breathtaking view of the sun setting over the Indian Ocean will whet your appetite, revealing the magical night sky of a billion stars and the hypnotic melody of the ocean. Once ushered to a table of gourmet victuals and champagne, with only the moon and torches lighting your feast, the universe is reduced to just the two of you. What a wonderful way to start the evening. - Please note that babysitting is not provided at the Resort. -One-way transfer (Male Airport to Resort or Resort to Male airport) can be arranged at 50% of rates quoted in the contract. -Cancellation with less than 48-hours’ notice prior to the date transfer will be subjected to 50% of to the total invoiced. No show will be charged at 100% of the total invoiced. arranged at 50% of rates quoted above. will be subjected to 50% of to the applicable rate. - No show will be charged at 100% of the applicable rate. hence the Resort will require guests’ information upon reservation. 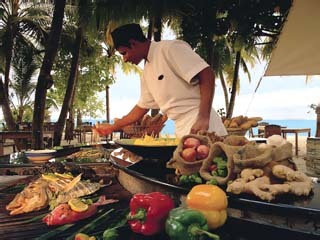 prepared & served on the villa terrace by private chef & butler. 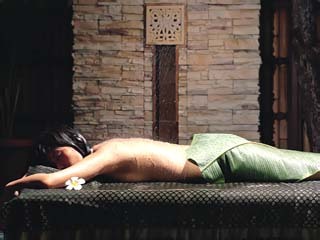 - 20% DISCOUNT on 90 min session Ala Carte SPA treatment. - Applicable for consecutive stays of minimum 04 nights. 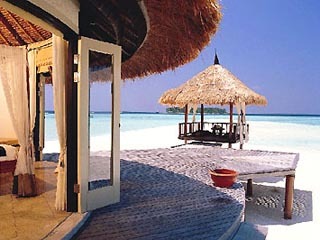 - Honeymooners’ benefits are valid up to 6 months after wedding. presented at check in time to the resort. excluding 28th Dec 13 – 03rd Jan 14 & 29th Jan 14 – 07th Feb 14. - Applicable for minimum 04 Nights stays. footbath and post treatment refreshments & relaxation. 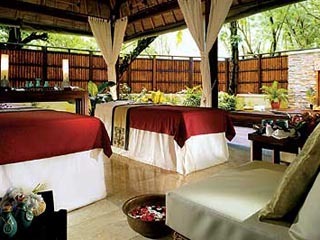 - Spa session must be utilized on daily basis and cannot be accumulated. 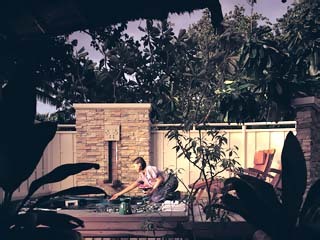 - Quote “Spa Supplement” when making reservations. No refunds will be made for any under stays. 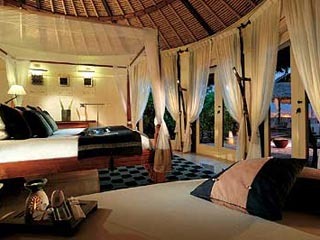 In the event of any under stays, the Resort will charge for the entire duration of the stay. *Full payment should be received before the cancellation period. 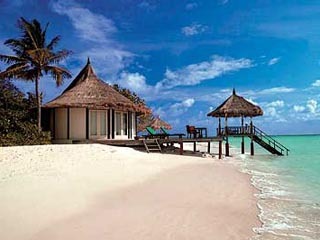 the Resort will charge for the entire duration of the stay.